Greetings from the Nevada desert! Iʼm Sully, a former camp horse. I was rescued from a feedlot where my next stop would have been a slaughterhouse if not for the kind people at Shiloh Horse Rescue. Iʼd like to tell you a little about Shiloh and, in particular, about their Guardian Angel Program. The 40 acre Shiloh Horse Rescue has been in operation since 2003. In that time, it has been responsible for rescuing over 500 horses from slaughter, abuse, neglect, and/or hardship situations. Over 300 of these horses have been adopted out to new, loving homes. Others have stayed and lived out their lives in Shilohʼs sanctuary. There are approximately 75 horses currently residing at Shiloh. 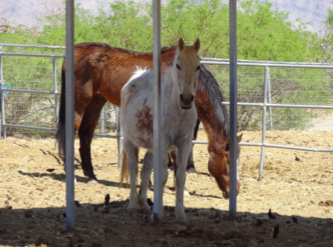 Several are previously rescued horses that have been adopted and continue to live on the property as boarders. Some are either available for adoption or are in training so that they might have the opportunity to be adopted as well. 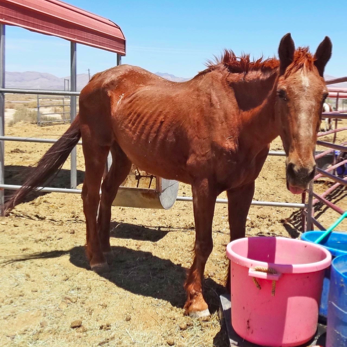 Others are sanctuary horses, animals whose age, injuries, or conditions render them “unadoptable” except in very rare cases. These horses live out their lives happily in one of several large pastures, or they wander freely around the property, serving as mascots and a welcome committee for the visitors and volunteers who frequent the rescue. Within the group of sanctuary horses are a number of us who fall into a special category. We are all 25 years old and older; some of us are in our 30ʼs! And because of our age, we now have special nutritional needs. We still need hay. Among its many benefits, grazing on hay releases enzymes that control the acid in our stomachs, reduce stress, and help our digestion. However, because we lose our teeth with age, we are no longer able to completely digest the amount of hay we consume. The result? We do not get sufficient nutritional or caloric intake from the consumption of hay alone. What does this all mean? It means that we need more easily digestible, calorie rich, nutritional food to supplement our diet if we are to remain healthy. But hereʼs the problem… hay has doubled in price in the last year alone. This has put a tremendous strain on Shilohʼs operating budget. Hay is the rescueʼs number one expense. Nothing, not even vet care, comes near to what it costs for Shiloh to provide good quality hay for all of its horses. Shiloh has taken wonderful care of us for many years. It is the reason most of us have lived as long as we have. But good quality care and sky rocketing prices have created a unique problem for the rescue, and, to help address it, Shiloh began the Guardian Angel Program. 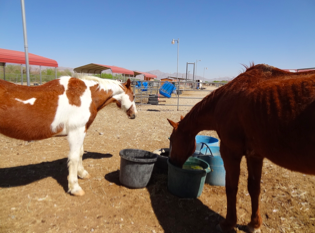 It costs $60 per month, per horse to provide the proper portions of supplemental food for those of us the rescue categorizes as “Shiloh Guardian Angel Gummies.” The benefactors who have stepped up to become ongoing, monthly sponsors for us are truly heaven sent. Sponsors are encouraged to come to the ranch and interact with us; however, it is by no means a requirement. We are lucky enough to have a sponsor from as far away as Australia! Shiloh does its best to thank its sponsors by sending them monthly updates about their “Angel” horse, small gifts, and inclusion in the Guardian Angel Hall of Fame, posted prominently on the patio for all to see. Of course, because Shiloh is a non-profit organization, donations are completely tax deductible. Shiloh Guardian Angel Gummies also have their own Facebook page where all of us gummies love to post pictures of ourselves and give “neigh outs” to our sponsors. Becoming a Guardian Angel is easy. Go to shilohhorserescue.com. Click on “Enter.” When you get to the home page, click on the button that says “New Become A Guardian Angel to one of our Senior Horses.” Scroll to the bottom of the page where you will find a PayPal link and other payment information. Important! If you use PayPal, please email either Sally VandenBerg at shilohsally@aol.com or Robin DiGiovanni at robdigio@yahoo.com with your contact information and the name of the horse you are sponsoring. They will then send you a thank you packet and keep you up to date on the progress of your “Angel” horse! Rather make a one time donation? No problem! Any amount is helpful, and your money will be placed in a general fund for all of the gummies. Just write “Guardian Angels” in the memo portion of your check, or, for PayPal, email Sally or Robin and let them know that you are making a one time donation to the Guardian Angel Gummies. Rest assured that 100% of your tax deductible donation will go for our care and feeding! Thank you and high hoof!! This entry was posted in Animals Around the World and tagged Guardian Angel Gummies, Shiloh Horse Rescue, Sully the horse on June 4, 2013 by Belkis Cardona-Rivera.